In this episode, we continue the theme of accommodation, this time looking at the campsite. Even if camping is not your thing, the constructions covered in this week’s lesson can be easily adapted. We’ll also learn how to spell in French. In this episode, we talk about Anna’s favourite pastime: shopping! We also test your knowledge of the French alphabet by spelling out the names of some shops you’d see in France. In this week’s episode, we talk about different ways of saying you’re not feeling well and how to say different parts of the body are sore. If you’re lucky, you may even learn a song which will help you to remember those body parts! In this week’s episode, we continue with the theme of ‘feeling unwell’ but this time we head to the pharmacy to find a remedy for whatever is wrong. In this episode, marking the end of Unit 3, we put Anna and you, the listeners, to the test. We cover all the topics included in Lessons 21 to 29 to see how much you have learned! This episode introduces Unit 4 which will feature dialogues recorded live in France. Join Mark and Anna en route to Brittany as Anna tries to remember the words and phrases she’ll need for her visit. Join Mark in this week’s episode as he arrives at Nantes Airport and asks for directions to get to Sainte-Marie. This gives you the chance to practise listening to French conversation and learn some new language at the same time. In this episode, join Mark and Anna in France as they arrive at the hotel. Anna plays the role of Jane Johnson, a British tourist who is checking in at the hotel. 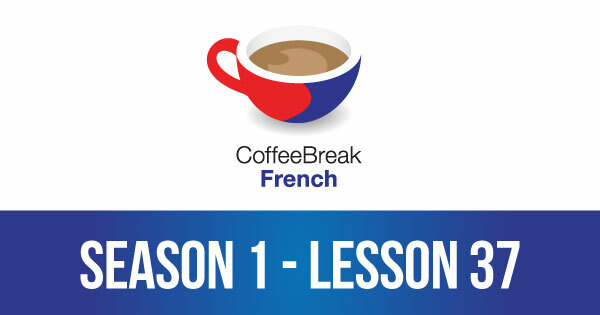 In this dialogue, you’ll recognise lots of the words and phrases covered in Lessons 22 and 23. In this week’s episode, Mark and Anna are in the Tourist Information Office in Sainte-Marie, looking for some information about the area. In this week’s episode, we are continuing our series of dialogues recorded in Pornic and Sainte-Marie. We have 2 conversations recorded on shopping trips in France – one with Mark and one with Anna and her friend. In today’s episode, we have a special dialogue for you. We’ll be listening to a conversation recorded on the beach in Sainte-Marie where Anna talked with a French family. The last episode of Season 1, is based on another conversation we recorded on the beach in Sainte-Marie.